Many founders and early stage startup employees consider content (rightly) to be part of an inbound and organic strategy – basically a “Marketing Thing”. 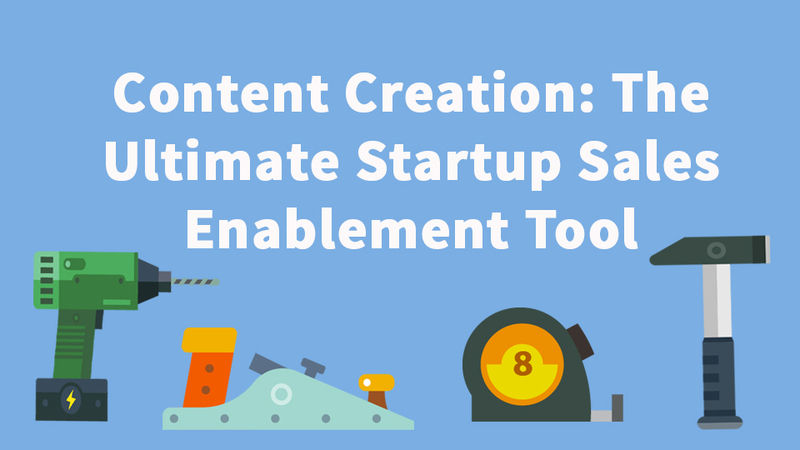 What is often overlooked is content’s key role as a sales enablement tool. Sometimes leads go cold. Sometimes opportunities go cold. Whatever the reason, a big part of being successful at sales is the ability to re-engage and that can be hard because a salesperson may run out of reasons to do so without sounding desperate or annoying. This is where content marketing comes to the rescue as a sales enablement tool. If you can generate blog posts and other thought leadership material regularly, it provides your sales team with content that they can use as an excuse to follow up with a potential client. I was reading one of our blog posts on “Implementing Salesforce at Your Startup? Here’s What you Need to Know” and I thought of you. There is some great advice on selecting a partner that I think you might find useful. Give it a read, I’d love to hear your thoughts on it and how it applies to ACME’s CRM implementation plans. Now, in the best case scenario that lead is going to respond to the email, perhaps even call. But in the absence of that, with tools like the SalesforceIQ for Gmail plugin and Pardot, the salesperson will know if they opened the email, how often, if they clicked through and how long they spent on the article. All great intelligence on where the lead’s head is at – easily referenced in Salesforce. This concept of blog posts and other material being a finger’s touch away sounds great, but what if you don’t have applicable content? Let’s say it is Tuesday afternoon and you are having a weekly pipeline review with your VP of Sales. In going over the opportunities that are stuck, you discover that your biggest deal has stopped moving. Sales has run out of ways to try to unstick it. So what now? Sometimes a big deal is worth creating content for. A lead or opportunity is so valuable that it can’t be left to whither on the vine. This is where your small (maybe even one person), but mighty marketing team can come to the rescue. If the ACME deal is stuck, they can sit down with the salesperson responsible, go through the opportunity or lead record together, examine what the customer has spent time reviewing on the website and decide on a piece of collateral to create. It might be a blog post or it might be a use case, but marketing can produce something impressive looking in 24 hours that the salesperson can then use to re-initiate contact. In other cases the opportunity might be moving along as expected, but the potential client is concerned about your company’s understanding of their space or ability to execute. This is a common issue for startups. One way to help allay those concerns is to produce a piece of content that is custom made for them (although they don’t know that). Sales, Marketing and Leadership need to work hand in hand to ensure that the content that is created by Marketing is targeted towards the leads that Sales is pursuing. When all three groups sit down to plan their method of attack for going after top prospects (which they should be) then Marketing has the opportunity to create material specifically for this. Step 3: Marketing creates blog posts and/or finds industry insiders to guest post, while at the same following and building a rapport with other industry influencers on social media. Step 4: Where possible, also take an existing piece of evergreen collateral like an ebook and update it with new creative, a new title, add the new blog posts, update some key phrases within and voila, the “Marketing Automation Guide” ebook becomes the “Marketing Automation for Startups Guide”. Your sales team now has two blog posts, perhaps a case study and a whole ebook that they can use as they pursue leads and close deals. Not only can that content be used to engineer interactions, it also demonstrates insight and expertise into your client’s vertical that competitors may not be able to match. Your sales people (or you as a founder) are trying to sell a product to people who have likely never heard of your product and have no idea they have the problem you claim to be solving. Generating content not only helps create and nurture leads, but it is also an excellent tool for reengaging stalled opportunities and keeping the sales cycle moving. One more sales enablement tool for the team to use in closing deals.